Viewing crystals under a microscope is fascinating. Something as simple as table salt or sugar provides beautiful images when placed under a biological microscope or even a polarizing microscope! Table salt captured under the MT9300 polarizing microscope. This science project involves making some of your own crystals, prior to viewing them under the microscope. Gather some table salt, sugar, epsom salt, fresh lemon juice and fresh orange juice. Place a teaspoon of hot water in a small bowl, slowly adding salt until nothing else will dissolve. Put this mixture on a clean glass depression slide and set your slide in direct sunlight so the liquid will evaporate (a window ledge is a good place to leave the slides). Continue this process for each of your samples, making sure to label your slides after preparing them. Once the liquid has evaporated from your samples, look at each slide under the microscope, starting with the lowest magnification (40x) and working your way up to the highest power. Notice how different the crystals appear. Salt typically forms small cubed-shaped crystals, but you might notice some hexagon shaped crystals from the Epsom salts. If the crystals are hard to view and you do not have access to a polarizing microscope, you can use polarizing film to obtain the same affect. You will need two pieces of polarizing film. Place one piece over the light beneath the microscope, and the other piece over the slide on top of the stage. Make sure that the polarizing film over the slide is at a right angle to that beneath the stage. As the water evaporates from your substances, the particles from sugar, salt, etc. have bonded together to create crystals. When viewing with polarization, the light is split into different colors, making the crystals easier to view. 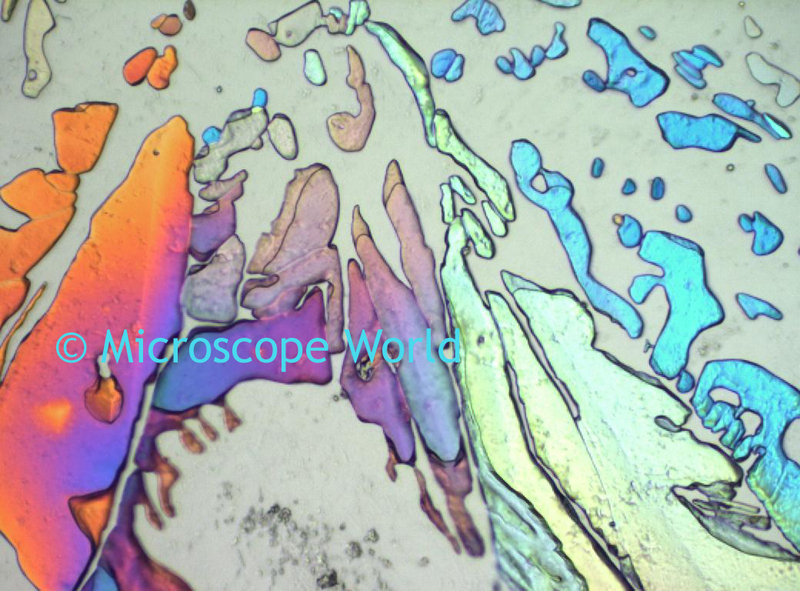 Sugar captured at 200x magnification with a polarizing light microscope. 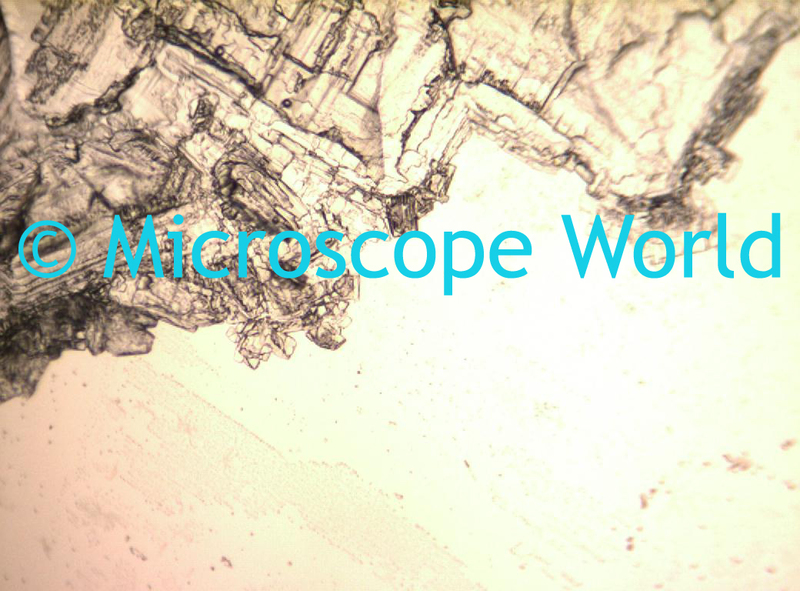 Take note of the types of crystals you view through the microscope and how the samples differ from each other.